My books are in the Walmart online bookstore. Walmart has partnered with the Canadian company Kobo, a worldwide seller of ebooks and ereaders. Frequently, my ebook sales are higher on Kobo than Amazon in several countries, Canada and Japan in particular. This isn’t surprising since Kobo is owned by Japanese e-commerce giant Rakuten. However, Kobo is more than a two-country company. Wired magazine has called Kobo the “only global competitor to Amazon,” in the ebook market. I welcome this new partnership and the competition it will provide to Amazon. I checked and my Kobo books, Through Many Fires, A Time to Endure, Braving the Storms, and others are now on the Walmart bookstore. Kobo ereaders are already available in Walmart stores. There are rumors in the industry that Walmart and Kobo are working on a reading program similar to Kindle Unlimited. Walmart is also rumored to be working on another streaming service in addition to Vudu. If Walmart and Kobo could come together and create their own version of Amazon Prime it could be a win for both readers and publishers. I remain watchful and hopeful. It’s not my fault—it’s the Olympics. Last month I said that I would take some time off to watch the Olympics—but writing will dominate my days. It didn’t quite work out that way. Oh, I did take some time off, but writing didn’t dominate my days. I’ve always enjoyed the bobsled, luge, skeleton, ski jumping, hockey, snowboarding—okay, I like many of the events, but during these games my youngest son and I both developed a keen interest in curling. The rest of the family found our interest amusing, but it really is a strategic game. But the Winter Olympics are over now and I’m officially behind schedule on all of my writing and editing projects. I hope to be done with a sidequel of Through the Storm by the end of March, more than a month behind schedule. In this story, I’m following Major Franklin through the same time period as Neal Evans. Into the Storm is the working title for this sidequel novella which should be released in May of this year. The full-length sequel to Through the Storm is the other writing project I’m currently working on. This, as yet unnamed, novel will continue the plot of both the earlier books (Through the Storm & Into the Storm) and bring some of the characters together and they struggle to survive. I’m going to work very hard to have the sequel, and the sidequel, ready for release this year. February was a short month and I didn’t get as much done as I wanted. Nearly every working day of this month will be devoted to writing and editing the sidequel and sequel to Through the Storm. Okay, I will take some time off to watch the Olympics—but writing will dominate my days. If I don’t write and edit each day I fall behind. In the picture I’m holding one month of edits for my current writing projects. I hope to be done with a sidequel of Through the Storm by the end of February. Sidequel isn’t a real word, yet, but authors sometimes use it for stories that portray events that occur at the same time as the original work, (Through the Storm), but with different characters in a different setting. In this case, I’m following Major Franklin through the same time period as Neal Evans. Into the Storm is the working title for this sidequel novella which should be released in May of this year. The full-length sequel to Through the Storm is the other writing project I’m currently working on. This, as yet unnamed, novel will continue the plot of both the earlier books (Through the Storm & Into the Storm) and bring some of the characters together and they struggle to survive. The sequel should be ready for release at the end of this year. Click on the link to read more about my upcoming books on the projects page of my website. I first met Houston two years ago when I spoke about writing as a career at Centralia High School. I read some of his work and noticed a definite writing talent. Then a few weeks ago my friend Julie Zander asked if I’d like to help her mentor a writer as part of the local Rotary/TRiO program. The program pairs students with adult professions for a job shadow and mentoring day. When I saw Houston’s name on the TRiO form I agreed to take part. Houston and Author Kyle Pratt at the TRiO lunch. Now a junior at Centralia High School, Houston writes very descriptive fantasy and, while Julie is an excellent non-fiction writer, she wanted my fiction perspective included in the mentoring. The three of us met at Centralia College. While there we discussed writing as a career and the training and education that advanced our careers. Houston also wanted to know how a typical work day looked. As part of that answer, we took him to my home office where I spend most of the day on a keyboard staring at a computer screen. After that, we joined the 61 adults and about 80 students from area high schools for lunch at St John’s Lutheran Church in Chehalis. It pleased me to see so many adults willing to take time out of their day to mentor the youth of our community. I was also glad to see so many young people eager to learn more about careers. Author rankings change constantly, and I tend to be more focused on sales than my position on Amazon, but when I break into the top 10—well, I’ve just got to lean back and enjoy the moment. For several years, I’ve been happy to be a mid-list author writing stories I enjoy. Every year my sales have grown, but every business needs to advertise. So, we’ve been running a marketing campaign with Through Many Fires and, this has propelled sales higher—and moved up my author rank. It will slide after the marketing campaign, but right now I’m enjoying the feeling. My friend Debby Lee is changing. Many writers are shy, solitary, individuals that like nothing more than writing their stories and sending them off to agents and publishers. When I first met Debby I saw that reticence in her. She already had thirteen books on Amazon, before the recent release of The Courageous Brides Collection. About that time she signed with Tamela Murray of the Steve Laube Agency and began writing for Barbour. With the upcoming release of the Mountain Christmas Brides anthology and the Pony Express Romance Collection scheduled for release in April of next year, Debby will be asked for more interviews and to be at more events. Debby was recently interviewed, and has been written about in several blogs. A few days ago she was at a book signing. The shy woman I met a few years ago is evolving into a more confident outgoing author. I’m happy for my friend. Someone once said, “There is no such thing as bad publicity.” I’m not sure that’s true, but in this case I was very happy to see my name mentioned several times in The Chronicle, my local paper. A friend of mine, Julie McDonald Zander, writes a column for the newspaper, and recently called me. Her first questions were when and why I started self-publishing. I told her I started my business in August of 2013, but I prefer the term indie-publishing. Self-publish has the image of boxes of books stacked in the garage that will never be sold. I keep a few copies of my books to give to reviewers and bloggers, but other than that I have no inventory. I should have added that my books are sold in over sixty-five countries and on every inhabited continent. I’m trying to find a way to get my books to Antarctica. I’ll be speaking this September at the Southwest Washington Writers Conference on using Amazon, Nook, Kobo, iTunes and Smashwords for broader ebook distribution. I’ll also talk about how to use print-on-demand and audiobooks for greater reach. The conference is in Centralia on September 17th. If you’re interested you can register here. Until recently, most writers went through agents and traditional publishers. During our conversation, Julie asked me if I ever regretted not going the traditional route. I told her that if I had waited to be traditionally published I might have one or two books out by now, maybe none. Later, as I reflected on my comments, it occurred to me that I don’t think of my work in terms of Traditional or Indie. I can still sign a traditional publishing contract. I just don’t pursue one. By using indie-publishing, I now make a living running my own publishing business and writing books. No, Julie, I have no regrets. How many people does it take to create a novel? Recently I watched X-Men Apocalypse with one of my sons. At the end of the action we waited to see if there were any post-credit scenes (there is). As we watched the endless scroll of credits we discussed how many people were involved in the production of my last novel, Braving the Storms. Over the next few days I jotted down names of people who either worked for me on the novel, or volunteered their time. I hope I didn’t forget to include someone on the list below. This doesn’t include people working for distributors such as, Amazon, Nook and iTunes, or the numerous bloggers and reviewers that I speak with on a regular basis. While my list isn’t nearly as long as the movie credits, it still includes a lot of people, and I’m grateful to every one of them. Unlike many authors, Jennifer is an extrovert. Author Jennifer Vandenberg works the crowd. She denies it, but at a recent character creation workshop, I watched her work the room like a professional speaker. She listed fifty traits on the whiteboard. These ranged from age, gender and height to hobbies, hometown and favorite holiday. Then she went around the audience asking them what that attribute should be. After doing that for two characters she guided the group into basic plotting using the man and women they created. Everyone laughed and learned as we created zany characters and plots in one, very brief, hour. Besides being an excellent speaker and writer Jennifer Vandenberg describes herself as geology student, National Park ranger, secretary, tax preparer, swim instructor, school aide, library assistant, children's bookseller, merchandise supervisor, property curator, volunteer, farmer, and blogger. That resume sounds like it comes from an extrovert. No matter what she says she is, I recommend her books and workshops. There are serious reasons to be an indie writer, and not so serious ones. This is a look at a few of both. 1. No Alarm Clocks. I live on a small farm so I still get up early, but almost never to the blare of an alarm clock. Usually I get up to the morning sun coming in the bedroom window or the sound of chickens clucking to be fed. On those rare occasions when I must get up early for a flight or other trip, I struggle to remember how to set the fancy alarm clock by my bed. 2. My Three-Step Commute. Auto insurance agents always ask, “How long is your commute?” I love explaining my morning trip to them. The door-to-door commute from my bedroom to my office is three steps. However, I usually take a fourteen-step detour to the dining room for breakfast. 3. Casual Days. I wear slippers to the office because every day is casual Friday. If I wake with a great story idea I might start the day working in my robe. No one complains about my beard and I can go days without trimming it or shaving. 4. The Daily Schedule. I still have busy days and enough appointments that I keep a synched schedule on all my electronic devices, but it is MY schedule. If an old friend calls or my wife wants to go out for lunch, things get moved around. My time is my time, and the schedule is always clear for Seattle Seahawk games. 5. It’s My Company. I probably work more hours than I ever did for an employer and I still have deadlines, but now every book I write, every promotion, conference or blogpost is part of building my company and my future. There are downsides to being a writer, and even more so to being an indie writer. We’ll talk about those in future posts but, for me, I can’t imagine doing anything else. I like to set goals. Each week I list chapters and blogposts that I’ll write, marketing plans to investigate or execute, people to contact and more. One long term goal I have is to write 120,000 words this year. Many writers do more than that, but this would be a personal best. To track my progress, I use an Excel spreadsheet. Earlier this week, when I entered my word count, I discovered I reached something of a milestone. I’ve written 100,000 words so far this year. You can keep track of my progress by clicking here. While I haven’t achieved my 120,000 word goal, I’m closing in on it. I’ll let you know when I reach the final goal. The first book I read was Starman Jones by Robert A. Heinlein. After that, I read every other book the master of science fiction wrote. I first toyed with the idea of writing as I read one of Heinlein’s novels. More than ten years passed before I completed my first short story and then another ten years slipped away before I attempted a novel. As I struggled with that first, still unpublished book, I came across Heinlein’s five rules for writers. Gradually, I set aside that first clumsy novel and went on to finish, and publish, others. Through it all, Heinlein’s simple rules have remained with me. I present them here with my thoughts and commentary. Many people tell me they have an idea about a novel. My standard reply is, “You should write it.” Very few ever do. It sounds obvious, but if you’re going to be a writer you need to write. Most never get beyond rule number one. The poet and writer Dorothy Parker once said, “I hate writing, I love having written.” Most that start a novel never push on to completion and so, never know the joy of “having written.” It’s a struggle to complete that first novel and, while it never gets easy, as you hone your craft, the task becomes less arduous. An author must persevere to completion. I know some fantastic writers that never submit their work to agents or publishers. Over and over again they edited and rewrite chapter after chapter. Their work is often spellbindingly beautiful, but few will ever read it. Write the best manuscript you can, submit it to a critique group, perhaps some beta readers and a final rigorous editor—then move on. Another rule that seems obvious, but I know a writer with dozens of completed novels in his office. All of them are ready for the market, but aren’t on it. In today’s digital world there are three viable market options for authors, traditional publishing, indie publishing or a hybrid of both. Learn about all three and keep your books on the market. Rule five: You must keep it on the market until it has sold. If you want to be an author, don’t give up. Find a way to get your books to readers and, while continuing to sell your currently completed project, return to rule number one and start the process again. It’s nearly ready. The next book in the Strengthen What Remains series, A Time to Endure, is in the hands of beta-readers. In the picture on the right I’m about to mail the first sixteen chapters of A Time to Endure to one of the beta-readers. In the upcoming novel, the exciting saga of Major Caden Westmore continues. 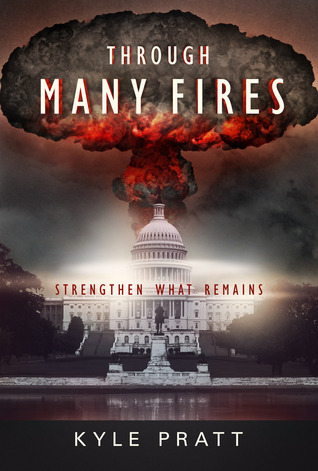 In the first book of the Strengthen What Remains series, Through Many Fires, nuclear terrorism destroys six American cities, leaving the nation in chaos. In the second novel, A Time to Endure, the economy teeters on collapse. The dollar plunges, inflation runs rampant, and the next civil war threatens to decimate the wounded country. In the face of tyranny, panic, and growing hunger, Caden struggles to keep his family and town together. But how can he save his community when the nation is collapsing around it? A third book in the series is planned for next year. A Time to Endure will be released in paperback and Kindle on December 12th of this year. In early 2015 the novel will be available on on Nook, Kobo, Smashwords and as an Audiobook. Enter and win a copy of Through Many Fires. During the month of October I’m running a Goodreads giveaway for ten autographed copies of my latest novel, Through Many Fires. This contest is open to Goodreads.com members worldwide. Giveaway ends October 31, 2013. Since I enjoy both reading and writing, I’m a fairly active member of Goodreads. You can visit my author page on the site here. If you’re a member of Goodreads go here to add your name to the giveaway. If you’re not a member, it is free to join and a good place to hear about new books and authors.